Remember all those frustrating times when you’re getting late and, thus, have to skip breakfast to make it to class/office on time? We’ve all been there. 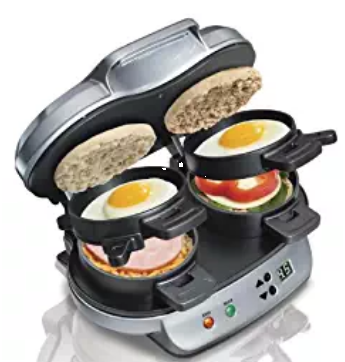 Now, Hamilton Beach brings you an exciting Dual Breakfast Sandwich Maker that lets you make delicious sandwiches in 5 minutes flat. It’s so easy and fun! Simply choose your favorite breakfast ingredients like bread, eggs, sausages, cheese or veggies; pop them into the convenient slots; and set your preferences. In 5 minutes tops, two delicious and perfectly assembled sandwiches will be ready and just waiting to be eaten. A handy digital timer beeps once the time’s up and the sandwiches are ready to pop. Say goodbye to burnt breakfasts! The various removable parts are all dishwasher-safe, making the sandwich maker very easy to clean after using. Best of all, it comes with a range of healthy and appetizing breakfast recipes that you can try using fresh ingredients—right from the comfort of your home. Now, you can bypass the annoying multi-step process of waking up an hour early, cutting and dicing all types of food items, and then washing a load of dirty saucepans, frying pans, and what-not. Simply pop your favorite breakfast foods into the Hamilton Beach Sandwich Maker, set the timer, and voila! Your sandwiches are ready to be grabbed and eaten as you rush off to start the day! See it here on Amazon!